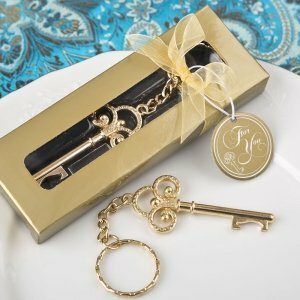 Unlock your heart and offer your guests a magnificent golden key as a keepsake! This is a favor that they will treasure for years to come. The key is made from gold metal and is fashioned in the shape of a classic skeleton key. It has a stylishly designed top with a striking raised metal dot pattern. The key charm is attached to a gold metal chain and gold metal keyring. Offer your guests a keepsake that they will keep on their home or office keys and be reminded of the time they celebrated with you on your special day. What size is the box that they key chain comes in? Thanks. Does the key bottle opener come in the box? Yes, the 'Key To My Heart Collection Gold Metal Key Chain Favor' is packaged in a gold one piece box with a clear window. Please note that this is currently out of stock but we expect it to be available again on August 6, 2018. However, you can still lock-in today’s sale price and order today. We will the item to you as soon as we get it. Simply add it to your cart and proceed normally through the checkout process.